The Cobalt-winged Parakeets (Brotogeris cyanoptera) have the largest range of the Brotogeris -- specifically they can be found in the extreme western Amazon Basin in Brazil's states of Amazonas, Acre and Rondônia; as well as part of the North Region. Their range also stretches from north to south, southern-most Venezuela and Colombia; eastern Ecuador and north Peru; in northern and central Bolivia, as well as in northern Bolivia within the tributary rivers to the Madeira River flowing northeast to the Amazon River. One small population occurs in Bolivia's northeast border region near the Guapore River. Based on their extensive range (in some parts of which they are considered "common"), they are not classified as endangered at this point in time -- in fact, it is believed that more than one million of them can be found in their natural habitat. At this point in time, populations appear to be stable (del Hoyo et al. 1997). For these reasons, the species is evaluated as Least Concern. Its natural habitats are tropical lowland evergreen forest, tropical lowland evergreen forest, second-growth forests and woodland areas. These parakeets are usually seen in the canopy and rarely seen outside the woodland. 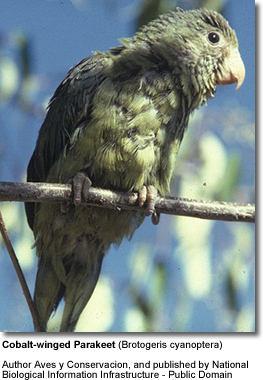 The Cobalt-winged Parakeets that were imported into the U.S. came from Bolivia - they were not imported in large numbers. The Cobalt-winged parakeet.(B. cyanoptera) is the most commonly misidentified member of the family. It is frequently confused with the orange-chinned parakeet. Even though it is named for the extensive area of blue coloration on its wings, this parakeet has the same orange chin patch of the orange-chinned parakeet. One easy method for determining the difference is the coloration on the head. Only cobalt wings will have yellow feathers around the nostrils. They average 7 inches (18 cm) in length and weigh between 1.75 to 2.3 oz (50 - 65 grams). They are virtually all green with yellow forehead and reddish-orange chin. The yellow forehead and lores (the regions between the eyes and bill on the side of a bird's head) are somewhat duller and less far-reaching in hens. The primary coverts and secondary feathers are purple/blues. The purple/blue outer primary feathers are edged with green and the remainder is purple/blue. The central tail feathers are dark blue with green margins. The next two feathers are green edged with blue, the remainder green. The bill is pale horn colored, tipped with brown. The bare eye rings are white. The eyes are dark brown. Young birds look like adults, except they have a brown bill. Gustave's Parakeets (B.c. gustavi): Average 7 to 7.6 ins (18 to 19 cm) in size. The carpal edge (= leading edge of the wing at the "shoulder") and the bend of the wing are yellow in both males and females. They have green outer primary feathers. 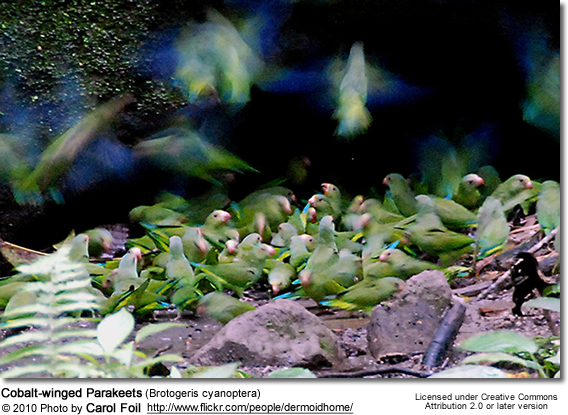 Beni Cobalt-winged or Blue-winged Parakeets (B.c. beniensis): Average 7 inches (18 cm) in size. Both male and female look like the Gustave's Parakeet - except the plumage is paler, with more yellow/green. There is a heavy tint of yellow on the forehead and lores (the regions between the eyes and bill on the side of a bird's head) and a strong tint of blue on the crown. The bend of wing, carpal edge (= leading edge of the wing at the "shoulder") and primary coverts are also yellow. The first successful breeding in the United States took place in 1983. Two years later (1985) the first successful breeding in England occurred. These active little parakeets are considered medium-noisy; and they are said to have an easy going, more passive, nature than grey-cheek parakeets. Their calls are described as sounding like those of the Tui Parakeet - a rapid repetition of high pitched notes. Additionally, clear splink splink notes or harsh, scratchy noises have been recorded. Description: Average 7 inches (18 cm) in size. Both male and female look like the Gustave's Parakeet - except the plumage is paler, with more yellow/green. There is a heavy tint of yellow on the forehead and lores (the regions between the eyes and bill on the side of a bird's head) and a strong tint of blue on the crown. The bend of wing, carpal edge and primary coverts are also yellow. Description: Average 7 to 7.6 ins (18 to 19 cm) in size. The carpal edge and the bend of the wing are yellow in both males and females. They have green outer primary feathers.